Balestier celebrate their third-place finish. 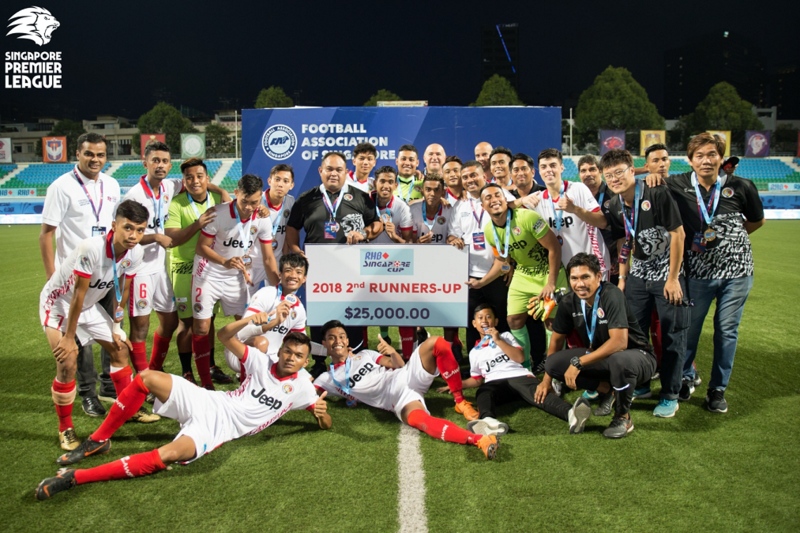 SINGAPORE, 6 OCT 2018 – Balestier Khalsa FC edged Home United FC on penalties to clinch third place in the RHB Singapore Cup after the game had ended 2-2 at Jalan Besar Stadium on Saturday evening. Lightning rarely strikes twice at the same spot, but it proved to be the case for Balestier as they had led 2-0 through Hazzuwan Halim and Keegan Linderboom only to throw away the lead – as they did three days ago against Brunei DPMM FC in the second leg of their semi-final. Faritz Hameed and Isaka Cernak scored for Home but Zaiful Nizam stood tall in the shootout by saving Fazli Ayob’s attempt, allowing Sanjin Vrebac to dispatch the winning spot-kick in a 5-4 success. The Protectors arguably controlled the entire game, but lapses in concentration saw them fall behind in the first half. Hazzuwan should have opened the scoring in the 25th minute after latching onto Linderboom’s knockdown, but Eko Pradana Putra was able to palm the ball away. The forward made no mistake from the penalty spot just a minute later though, converting the spot-kick after Huzaifah Aziz was felled by Shahrin Saberin. The lead was doubled in the 37th minute with Vrebac playing a delightful ball over the top for Hazzuwan, who cut it back for an arriving Linderboom to smash home. But it was all Home thereafter. Song Ui-young had an attempt from close range but he blasted over, while Izzdin Shafiq’s free-kick shaved the side of the woodwork on the hour mark. Home finally made one chance count in the 74th minute when substitute Fazli made an immediate impact with a superb free-kick delivery for Faritz to power in a header. Shakir Hamzah then headed Cernak’s teasing cross onto the post on 84 minutes but just when it looked like time was running out, Home finally drew level. Shahril Ishak tumbled over after being challenged by Shaqi Sulaiman in the box on 92 minutes and Cernak converted to send the game straight into the shootout. The first eight takers all found the net before Zaiful made his brilliant save from Fazli and Vrebac put away his effort with aplomb, leaving Balestier to end their season on a high. Home Head Coach Aidil Sharin: “We have to give our congratulations to Balestier, they have worked hard and gave us a tough time. “In the first half, we were not the best and it was a big difference from the way we played against Albirex. We were attacking but as a team, we didn’t defend well — they only had two good chances and they scored. “In the second half, my boys transformed back to who they were and they did well, coming back from 2-0 down. In the penalty shootout, anything can happen. Zaiful is more experienced and we have to give credit to him. Eko is still earning but it’s good for him to be up there and learn. “Even though we are fourth in the Cup, do not forget we faced Tampines and then Albirex. If we were in the opposite side of the draw, it would have been different. Balestier Head Coach Marko Kraljevic: “We started the first half very well and we scored two goals. We didn’t dominate the game but we played well with our passes and went behind their defense often. “In the second half we were under a lot of pressure and there were not many chances (for us), but they kept possession and didn’t make as many chances. “If you asked me now, I am not happy because I should be playing at 8pm (for the final). I like to win but I am not pleased to be playing at 5pm! Home: Eko Pradana Putra (GK), Shakir Hamzah, Song Ui-young, Faritz Hameed, Iqram Rifqi (Aqhari Abdullah 46’), Izzdin Shafiq (C), Faizal Roslan (M. Anumanthan 56’), Shahril Ishak, Shahrin Saberin, Hafiz Nor (Fazli Ayob 72’), Isaka Cernak. Unused subs: Kenji Rusydi (GK), Amy Recha, Muhelmy Suhaimi, Christopher Van Huizen. Balestier: Zaiful Nizam (GK), Fadli Kamis, Shaqi Sulaiman, Khalili Khalif, Nurullah Hussein, Hazzuwan Halim (Akbar Shah Zainudeen 76’), Sufianto Salleh, Huzaifah Aziz, Fariz Faizal (Nurisham Jupri 86’), Keegan Linderboom (Noor Akid Nordin 59’), Sanjin Vrebac. Unused subs: Hafiz Ahmad (GK), Nazri Sabri (GK), Afiq Salman Tan, Daniel Hazreel.